The Group of Eight industrialized nations on Tuesday endorsed halving global emissions of greenhouse gases by 2050 in a declaration praised by the Canadian government. 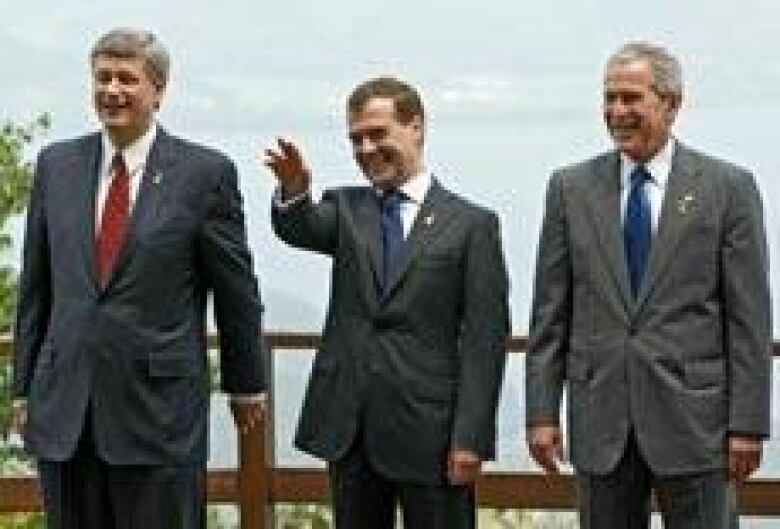 Canadian Prime Minister Stephen Harper, left, Russia's President Dmitry Medvedev, centre, and U.S. President George W. Bush, right, pose for a group photo at the G8 summit in in Toyako, Hokkaido, Japan on Tuesday. ((AP Photo/RIA Novosti, Dmitry Astakhov, Presidential Press Service))Environmentalists, however, expressed concerns that the statement doesn't mention a global baseline year for tracking greenhouse gas emission cuts or lay out any international midterm goals, instead allowing individual countries to develop their own plans. But Prime Minister Stephen Harper said getting the stamp of approval for long-term carbon cuts from two previous holdouts — the United States and Russia — signals a major breakthrough. "This is the first time either of those countries have conceded the necessity of having a long-term, mandatory goal for reduction," he said in an interview from northern Japan. "There's also now a firm recognition of all countries that to make these objectives effective, even in the long term, we have got to have mandatory participation by all major economies, by all major emitters." Leaders of the Group of Eight countries — Canada, U.S., Japan, Germany, Britain, France, Italy and Russia — gathered Tuesday for the second day of a three-day summit in Toyako, a resort town on the northern island of Hokkaido. The environmental group Avaaz.org ran a full-page advertisement in Tuesday's Financial Times accusing Harper, U.S. President George Bush and Japanese Prime Minister Yasuo Fukuda of blocking emission targets for 2020. Each leader's face is superimposed on the body of a Hello Kitty drawing, the popular Japanese cartoon character. The ad calls for the leaders to grow up and set targets. "It's great to talk about targets for 2050 but unless you talk about what's going to happen in the meantime, in 2020, then you're not really aiming for 2050 at all," said Ben Wikler, U.S. campaign director for Avaaz.org. "In 2050, Mr. Fukuda will be 114 years old and it's difficult to think that his promises about 2050 are meaningful unless he tells us what he's going to do now." Federal Environment Minister John Baird told CBC Newsworld Tuesday, in an interview from Japan, that the agreement isn't perfect. "We haven't solved the world's problems here but we've taken big steps forward," said Baird, adding it marks "substantial progress" since last year's summit in Heiligendamm, Germany. At that time, G8 leaders agreed to "consider seriously" decisions by the European Union, Japan and Canada to at least halve emissions by 2050 in setting goals for cuts in greenhouse gases. Baird said that leaders of the eight industrialized nations also agreed to "ambitious" short-term targets for 2020. Canada plans to reduce greenhouse gas emissions by 60 to 70 per cent based on 2006 levels, said Baird. "We've said we'll go much further than 50 per cent. Canada is a rich, prosperous country and we can provide leadership," Baird said. The G8 statement sets the groundwork for the 2009 United Nations climate change conference in Copenhagen, Denmark. World leaders agreed at high-level UN talks in Bali, Indonesia, last year to hammer out a new global climate-change treaty by the end of next year. Such a treaty would cover the period after the Kyoto Protocol's obligations expire in 2012. Tuesday's declaration also acknowledges that all major economies must sign on to any future plan, though with different roles and responsibilities. At least one developing nation voiced its disappointment in the climate change declaration. "We are concerned that it may, in effect, be a regression from what is required to make a meaningful contribution to meeting the challenges of climate change," South African Environment Minister Marthinus van Schalkwyk said in a statement. "It is regrettable that the lowest common denominator in the G8 determined the level of ambition in the G8 declaration on climate change." Canada has been blasted at home and abroad for shirking its Kyoto Protocol obligations to cut greenhouse gas emissions six per cent below 1990 levels by 2012. Harper's minority Conservative government has said trying to meet those targets would have a dire effect on the economy, and instead has pledged to cut greenhouse gas emissions by 20 per cent below 2006 levels by 2020. G8 leaders also made a separate statement on oil production, calling on oil-rich nations, including Canada, to ramp up production to bring skyrocketing prices back down. Crude has shot up nearly 50 per cent since the start of the year, and analysts expect that trend to continue into the second half of 2008. Also Tuesday, leaders of the G8 released a statement threatening to deploy "financial and other measures" against those responsible for violence leading up to last month's widely discredited runoff presidential election in Zimbabwe. Opposition party Movement for Democratic Change has said dozens of its supporters have been killed since MDC Leader Morgan Tsvangirai won more votes than President Robert Mugabe in the March 29 election, but failed to clinch the race without an outright majority. Tsvangirai pulled out of the race ahead of the second round of voting June 27 over safety concerns for his supporters, leaving Mugabe to glide into his sixth term in office. The Group of Eight's statement condemned attacks against opponents of Mugabe, largely reiterating what some members have already said, such as refusing to recognize the legitimacy of Mugabe's government. Canada and Japan indicated at the outset of this week's G8 summit that they would urge their counterparts to issue a stand-alone statement on Zimbabwe.